Al Adeed Al Shaqab (Ansata Halim Shah x Sundar Alisayyah) 1995 straight Egyptian stallion, was an international champion at the highest level; World Champion, All Nations Cup Champion, Egyptian Event Champion and has sired an extensive group of international champions, including the 2010 Egyptian Event Champion Colt and Supreme Male, Farhoud Al Shaqab; 2011 Egyptian Event Champion Mare and Unanimous Supreme Champion Female, Laian Al Shaqab and Reserve Champion Colt, Ghasham Al Shaqab; 2012 Egyptian Event Gold Champion Mare, Hooria Al Shaqab and Gold Champion Colt, Ghasham Al Shaqab; 2013 Egyptian Event Silver Champion Mare, Yakoutah Al Shaqab and 2014 Egyptian Event Gold Champion Mare Amina Al Shaqab and Gold Champion Colt, Tajj Al Shaqab. We consider Al Adeed Al Shaqab to be a near perfect example of the breed standard and attribute his idealistic conformation to his dam, Sundar Alisayyah (Ruminaja Ali x Imperial Sayyah) and type to his sire, Ansata Halim Shah (Ansata Ibn Halima x Ansata Rosetta). Al Adeed Al Shaqab has proven to be a consistent progenitor of his conformation and type and is represented in the Al Shaqab breeding program by a significant yet growing number of sons, daughters and grandchildren. 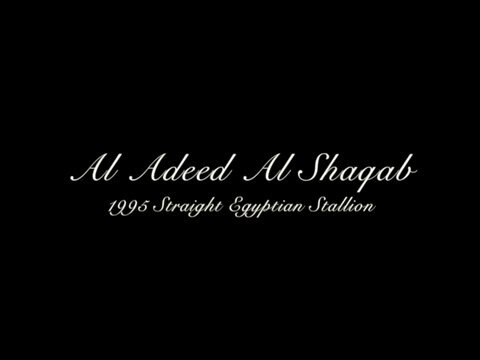 In 10 years of competition, Al Adeed Al Shaqab prevailed on three continents and won every competition he entered. Al Adeed Al Shaqab also prevails as the third top leading Egyptian Event sire following the 2012 Event. 2012 Filly Silver Medal Qatar International Straight Egyptian Arabian Horse Show.